I am SO bad. Not taking pictures at the 4th Annual Encaustic Conference……at Montserrat College of Art, Beverly MA. I will say that I had difficulties as I mentioned before. I got all my stitches removed today and hope I am well on my way to totally mending. I signed up for a workshop with the phenomenal Daniella Woolf on Tuesday after the conference……..emphasizing words and text. The workshop was called A WAY WITH WORDS. She had so many tips for using encaustic and words/text in you paintings. I got carried away with painting and did my own thing using some of her methods and mostly just my own. Thea Haubrich, a wonderful Canadian artist, and a member of International Encaustic Artists (IEA) was more objective than I and remembered to take a lot of pictures. It’s wonderful she even has some captions for a lot of the pictures. I hope you enjoy them as much as I do. It reminded me of things I would have forgotten. 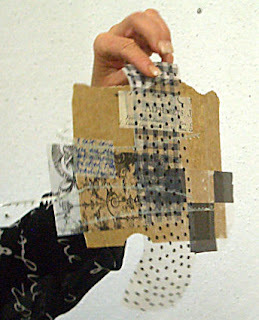 Here’s one of the images of the work she collaged on the hot palette and then lifted up. THIS gives me lots of ideas.